Clutter can be a huge problem, no matter how large or small your family is. We have seven people living together in a smallish house, and all of us are at home together all day, almost every day. If we’re not careful to stay on top of it, the clutter can easily get out of hand! One of my goals for this year was to get every single space in our home completely organized. It may be a more ambitious goal than I can realistically accomplish, but I figured it didn’t hurt to try. 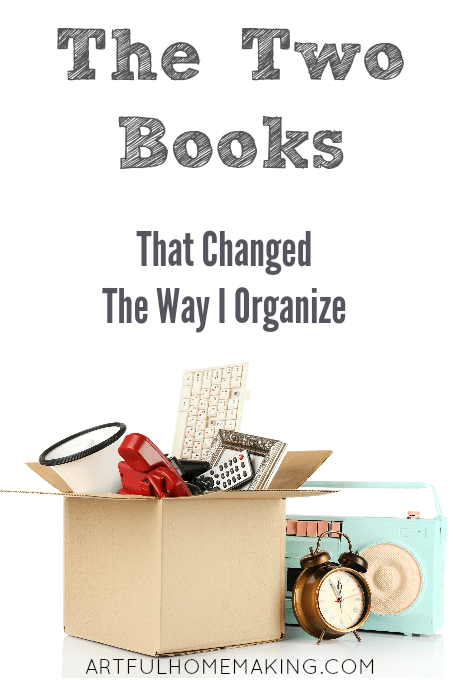 I’ve read many, many organizing books through the years. And most of them offer similar suggestions. Gather three bags or boxes and label them “giveaway,” “put away,” and “throw away.” I’ve used that method for most of my life. And it works, mostly. But what I was really wanting to do is eliminate the problem of clutter in the first place. Rather than constantly chasing it down and trying to organize and contain it all, I wanted to have fewer things coming in. I was looking for more simplicity, and a bit more of a minimalist approach. Enter The Life-Changing Magic of Tidying Up. I had been hearing about this book for a while, and I finally decided I needed to check it out for myself. Shortly after starting it, I was offered the opportunity to review Spark Joy, Marie’s second book. Since the two books go together, I decided the timing was perfect. I enjoyed reading The Life-Changing Magic of Tidying Up, even though there was quite a bit in the book that I couldn’t agree with and won’t follow. I just ignored the parts that didn’t apply to me as a Christian and applied the organizational wisdom that interested me. One of the most life-changing concepts in the books that reviewers mention over and over again is that the focus is not on what to get rid of. Instead, the focus is on what to keep. And you only keep those things that inspire or spark joy. 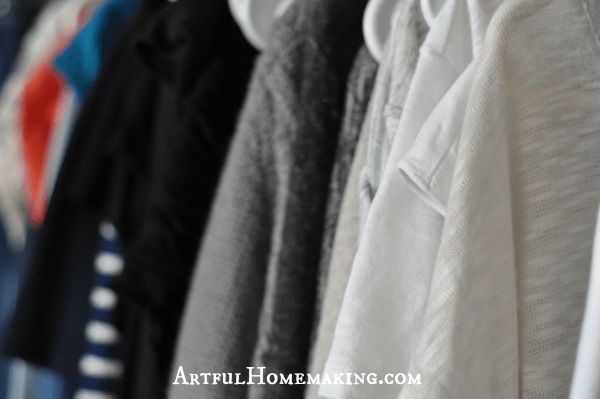 This made so much sense to me, and it has changed the way I declutter in our home. I can’t tell you how much I’ve gotten rid of since reading these books! And I’m not done yet. In fact, I’ve just begun. I will admit that sometimes I can’t follow Kondo’s advice. Even though an item doesn’t spark joy, I can’t afford to replace it, so I’ve got to keep it. But I still value the admonition to only have things around you that bring you joy. Whenever I’m able to buy a new pair of shoes, for example, I’ll be sure to pick a pair that I love, knowing that I’ll be more likely to wear them longer (and enjoy wearing them). I’ve always been a pretty deliberate shopper, but now I make sure I’m not buying something just because it’s on sale or it’s affordable. If I don’t love it, I don’t buy it (at least that’s the goal!). Have a discarding marathon all at once. KonMari tells you not to do your decluttering in stages, but rather to do it all at once. I see her point, but I found this to be a bit impractical for a homeschooling mom of five. I’m doing my best to follow her advice, though, by working on all the clothes for a week, then moving on to books, etc. Take each item in your hand and ask, “Does this spark joy?” If it does, keep it. If not, dispose of it. Again, I’m doing a modified version of this. I can’t get rid of everything that doesn’t spark joy, because we don’t have the money to replace everything that doesn’t spark joy. But I am freely disposing of things that are unnecessary items (such as decor and outgrown clothing and kitchen items) that don’t bring joy or aren’t useful to us. 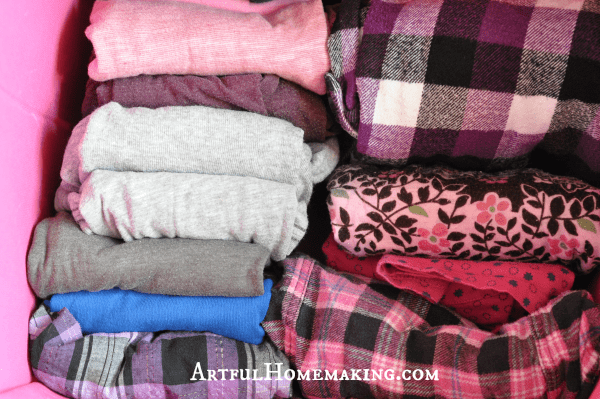 Sort by category (clothes, books, papers, miscellaneous), not location. KonMari says you shouldn’t, for example, decide to declutter and organize your bedroom (or any other room). 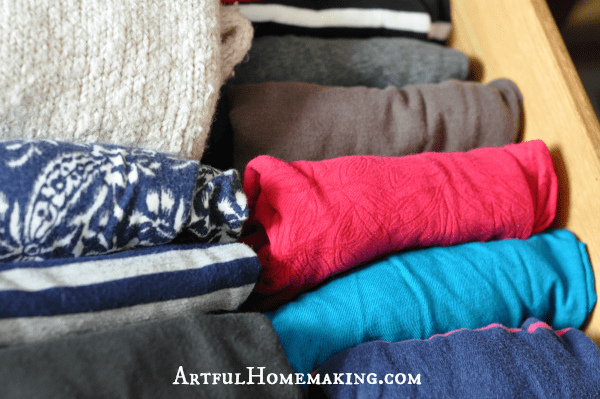 You should first do all the clothing in the house, then all the books, papers, etc. Give every item a place. Designate a spot for every item you own. This is huge. And it makes such a huge impact. I’ve been trying to do this, and it is so much easier to keep an organized house when every item has a place. Definitely good advice. Can you believe my drawers actually look like this??? 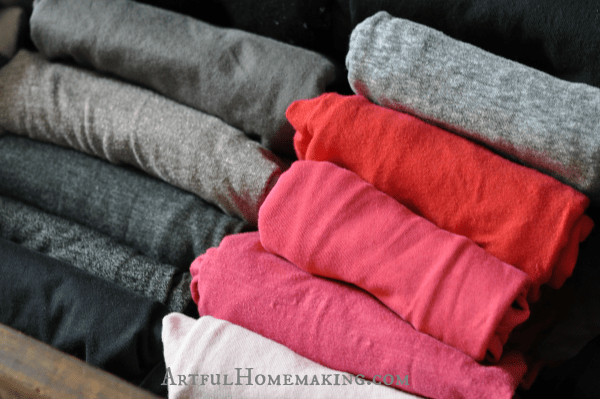 This is my favorite part of the whole KonMari Method: learning how to fold clothes so they actually fit in the drawers neatly. I can just pick out the one item of clothing I’m after, and it doesn’t mess up all the rest of the clothes in the drawer. It’s amazing! 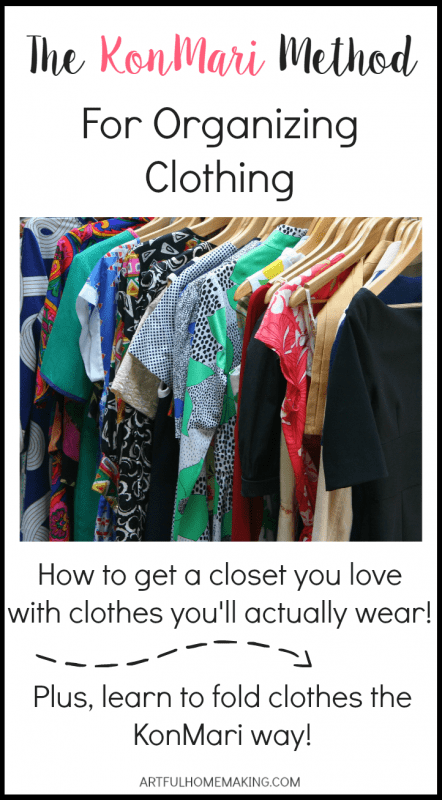 I love looking in my closet and seeing mostly clothes that I love and wear regularly (I say mostly because I still have some clothes that don’t really spark joy, but I can’t replace them right now, so I have to keep them!). The Life-Changing Magic of Tidying Up is the main book that describes the KonMari Method. Spark Joy is the second book, and it elaborates on the principles in the first book. The most useful aspect of the Spark Joy book is that it has drawings that teach you the clothing folding method. But you can also find videos on YouTube that will show you the same thing, and I did a quick folding tutorial here. So I’d say the first book is the most useful of the two. 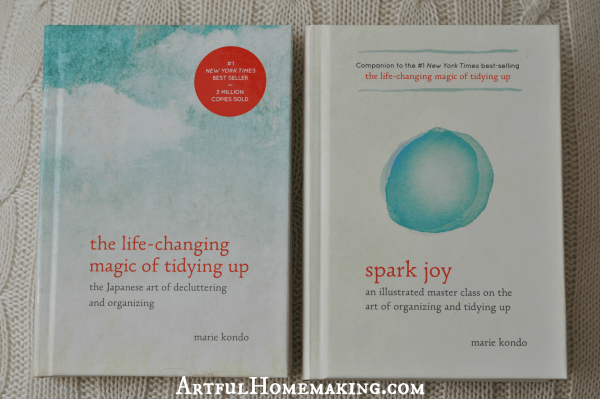 Have you read either of these books on decluttering and organizing? If so, what did you think of them? I received Spark Joy for free from Blogging for Books, in exchange for an honest review. This post contains affiliate links. Read my full disclosure policy. Sharing here. I have read the first book, but not the sequel. And, I agree, the idea of asking myself which items in my house "spark Joy" really resonated with me. It made it so much easier to get rid of things that really weren't adding value to my life but I was keeping for some reason. I'll have to take a look at the second book now! The "does it spark joy" question is such a simple thing, but it makes such a huge impact! Really great article and book review. I hope you will consider sharing with us on Literacy Musing Mondays. I need help with organizing so I will check these books out. I've heard so many good things about this book. After reading this I've finally broke down, I'm gonna check it out at the library on our next run. Pinning, stumbling and tweeting this post. Happy Tuesday! Thanks for sharing, Lindsey! And Happy Tuesday to you! I just recently read both of these books, and was really inspired by them. Like you said, as a Christian, there's some things you just disregard. But her overall approach grabbed me, and I have made more progress toward getting our house in order the past couple months than ever. I'm dealing with "paper" right now, and with having stashed and avoided so much homeschooling paper the past several years, let alone other paper, it's quite a task. But I'm motivated to keep on keepin' on. I like her folding method, too. And my husband even commented favorably on it. Popping in from T2T. So glad you stopped by, Heather! You're ahead of me, I haven't made it to "paper" yet. I know I've got a lot to go through. Most of it is filed in the filing cabinet (and in piles in my husband's home office! ), but the filing cabinet is so full we can hardly add anything else to it. 🙂 Can't wait to get that tackled. My husband was impressed with how neat the drawers are, too! I am a little bit obsessed with being clean and organized but have never heard of either of these books. I look forward to checking them out. 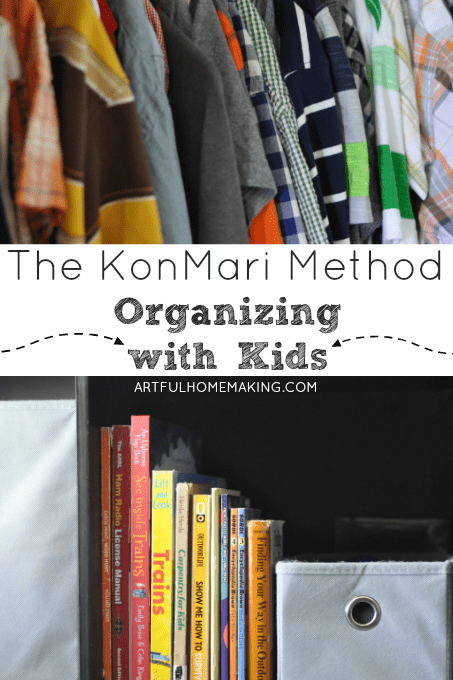 If you're into cleaning and organizing, you might enjoy them Danielle! The first book is the most useful, in my opinion. Thanks for stopping by! I love to clean and organize but I have never read either of these books. They look great, and so do your drawers. Hope you're feeling great soon, Gwen! I read the first book, and I did what you did. I used what I could and disregarded the rest. As a Believer, some of the thoughts and beliefs that she had were, of course, contrary to mine. However, overall, I found the book really inspiring and motivating and it gave me a kick in the pants to declutter. And declutter I did! I read it last spring and spent most of last year working on decluttering. In the process, I got rid of almost half of our belongings.